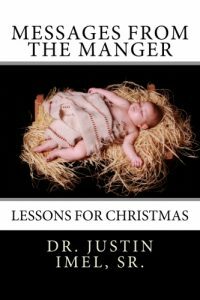 Messages from the Manger | Kindle | 99¢ | Dr. Justin Imel, Sr. The miracle of Advent–the Incarnation of the Son of God–calls for awe all year long. Whether the Son’s leaving glory for a sinful world or the Slaughter of the Innocents or the flight to Egypt or Jesus’ presentation at the Temple, God’s work for man’s redemption can be clearly seen in the events around the birth of His Son. In Messages from the Manger, Dr. Justin Imel, Sr., presents a series of lessons exploring the wonder of God’s redemptive act in Bethlehem.